The magi are arranged in a triangle. The ground the figures tread is triangular in shape. Mary, Joseph, and the cradle are aligned in the same pattern. Adults like it neat and orderly, yielding to Pascal's "Spirit of Geometry," with people in labeled boxes and life on the drawing board. From the carpet of daisies and the funny little figures comes a subtle message: There may be more to Christmas than the "Spirit of Geometry." 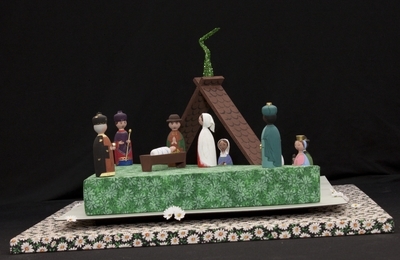 Painted wood figures depicting the nativity of Jesus, created in 1991 in Zurich, Switzerland by Elizabeth Kuchen. Exhibition label originally written by Fr. Johann G. Roten, S.M. for exhibit entitled "At The Manger" and held at Roesch Library, University of Dayton.